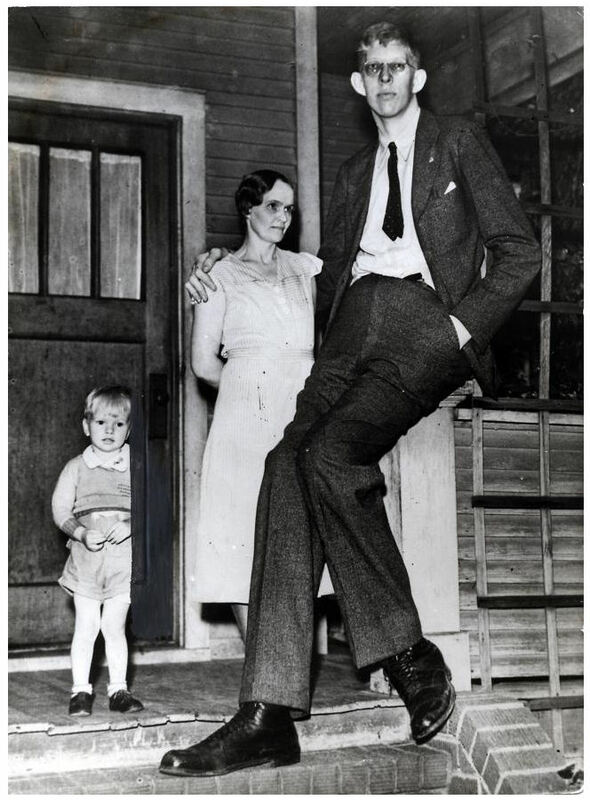 Robert Pershing Wadlow (February 22, 1918 – July 15, 1940) was a man who, to this day, is the tallest person in medical history for whom there is irrefutable evidence. He is often known as the “Alton Giant” because of his Alton, Illinois hometown. Robert Wadlow reached 8 feet 11.1 inches (272 cm) in height and weighed 490 pounds (220 kg) at his death. His great size and his continued growth in adulthood was due to hypertrophy of his pituitary gland which results in an abnormally high level of human growth hormone. He showed no indication of an end to his growth even at the time of his death. Robert Wadlow (Born Robert Pershing Wadlow on 22 February 1918 – died 15 July 1940) is the tallest person in medical history for whom there is irrefutable evidence. He is often known as the “Alton Giant” because of his Alton, Illinois hometown. Robert Wadlow reached 8 feet 11.1 inches (272 cm) in height and weighed 490 pounds (220 kg) at his death. His great size and his continued growth in adulthood was due to hypertrophy of his pituitary gland which results in an abnormally high level of human growth hormone. He showed no indication of an end to his growth even at the time of his death. Robert Wadlow’s size began to take its toll: he required leg braces to walk, and had little feeling in his legs and feet. 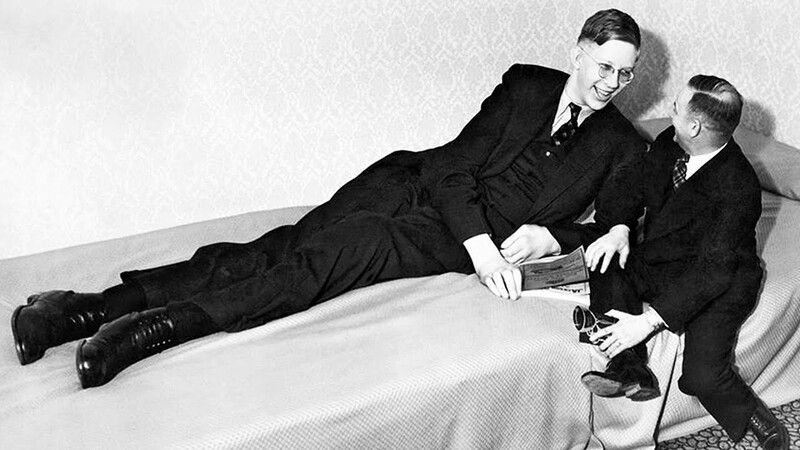 Despite these encounters, Robert Wadlow was never confined to a wheelchair. On June 27, 1940 (eighteen days before his death), he was measured at 8 feet 11.1 inches (272 cm) by doctors C. M. Charles and Cyril MacBryde of Washington University School of Medicine in St. Louis. In his time, Robert Wadlow was among the most popular of American celebrities; he obviously was well-known due to his 1936 U.S. tour with the Ringling Brothers Circus. He continued participating in various tours and public appearances. On July 4, 1940, while making a professional appearance at the National Forest Festival, a faulty brace irritated his ankle, causing a blister and subsequent infection. Doctors treated him with a blood transfusion and emergency surgery, but his condition worsened and on July 15, 1940, he died in his sleep. He was 22. 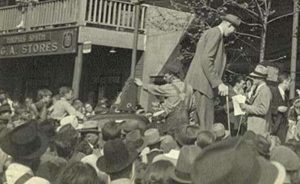 An estimated 40,000 people attended Robert Wadlow’s funeral on July 19. He was buried in a half-ton coffin that required 12 pallbearers to carry, which was interred within a vault of solid concrete. It was believed that Robert Wadlow’s family were concerned for the sanctity of his body after his death, and went to these lengths of security to ensure it would never be disturbed or stolen. In 1985, a life-size bronze statue of Robert Wadlow by Ned Giberson was erected at the Southern Illinois University Edwardsville School of Dental Medicine. He is also featured in film and with a wax replica in the Ripley’s Believe It Or Not! museum in Saint Augustine, Florida, Atlantic City, New Jersey, Niagara Falls, Ontario, Gold Coast, Queensland and Guadalajara, Mexico. A life-sized statue was part of the exhibits at the Guinness Hall of World Records in the Empire State Building in New York City.